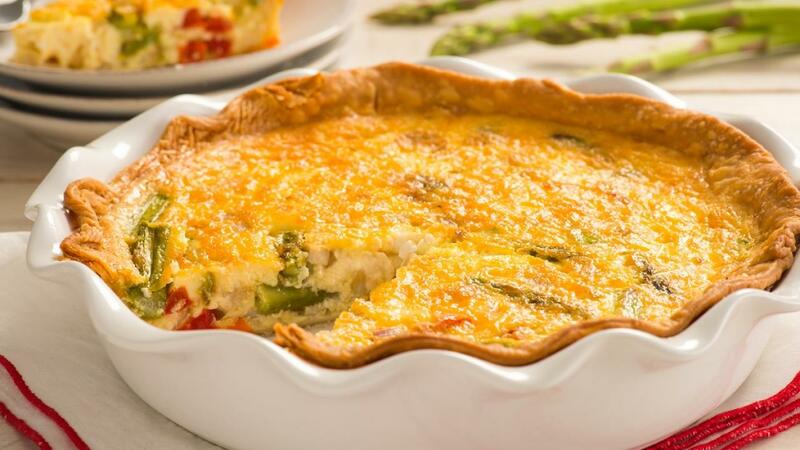 Quiche is the ultimate crowd-pleasing menu item that can be made with any of your favourite vegetables, meats, and cheeses. Quiche can be served on its own, or paired with salad, soup, or some fruit. Spread filling ingredients in pie shell. Whisk eggs and evaporated milk in medium bowl. Pour mixture over filling. Bake in preheated 350°F (180°C) oven until a knife inserted near centre comes out clean, 35 to 40 minutes. Let stand for 5 to 10 minutes before serving. Corn Quiche: Combine 1 cup (250 mL) fresh, canned (drained) or frozen (thawed) corn, 3/4 cup (175 mL) shredded Cheddar cheese, 1/4 cup (50 mL) finely chopped onion, and 2 tbsp (30 mL) chopped fresh parsley. Mushroom Quiche: Combine 1 cup (250 mL) sautéed sliced mushrooms, 1/2 cup (125 mL) shredded Cheddar cheese, and 1 tsp (5 mL) dried thym. 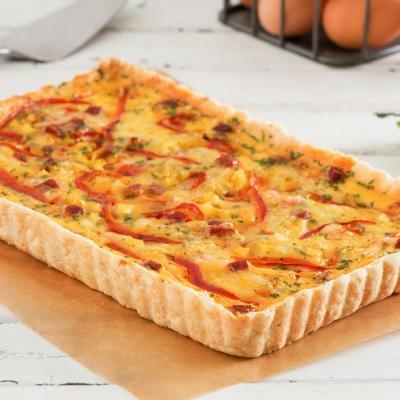 Shrimp or Crab Quiche: Combine 1 cup (250 mL) cooked shrimp or crabmeat, 3/4 cup (175 mL) shredded Swiss or Gruyere cheese, 1/4 cup (60 mL) chopped onion, 1/4 cup (60 mL) chopped green pepper, and 1 tsp (5 mL) dried tarragon. 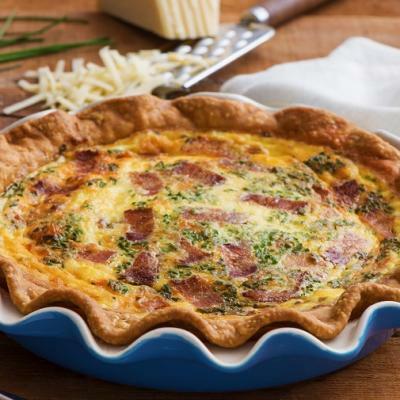 Ham and Cheese Quiche: Omit pie shell. 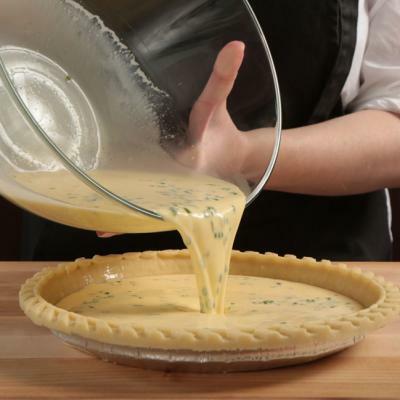 Spray pie or quiche pan with cooking spray. Line with crustless bread slices. Combine 3/4 cup (175 mL) shredded Swiss cheese, 3/4 cup (175 mL) diced cooked ham, 1/4 cup (60 mL) chopped red or green bell pepper, and 2 tsp (10 mL) finely chopped fresh chives. Quiche Squares: Omit pie shell. Spray a 9-inch (23 cm) square pan with cooking spray. Combine 1 pkg (350 g) frozen chopped broccoli (thawed and well drained), 1-1/2 cups (375 mL) shredded Swiss cheese and 2 tbsp (30 mL) Dijon mustard. Mini-Quiches: Prepare quiche in 3 x 7/8 inch (8 x 2 cm) tart shells. Or use slices of whole wheat bread as shells. Trim crusts from bread, then spread bread lightly with butter. Place buttered side down into muffin cups, pressing firmly. Bake in preheated 325°F (160°C) oven for 10 minutes. Remove and spoon filling ingredients. Then pour egg and milk mixture carefully over top allowing it to be partially absorbed, then adding more. Bake until puffed and golden, 16 to 18 minute. (If edges brown before quiche is set, cover with aluminum foil.) Makes about 24 mini quiches. To prebake pie shell, line the unbaked shell with 12-inch (30 cm) square of aluminum foil. Fill with raw rice or dried beans or peas. This will help to minimize shrinkage. Cover rim of shell with edges of foil. Bake in preheated 450°F (230°C) oven until lightly browned at edges, about 10 minutes. Lift out foil and rice. Cool on wire rack. Cooked quiche may be refrigerated for up to 3 days or frozen for one month, if suitably packaged. Any leftover egg mixture can be poured into custard cups and baked to make mini quiches.